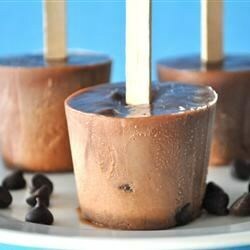 Make frozen fudge pops without a packaged pudding mix. I like using Tovolo popsicle molds. My sons likes the rocket shape. Combine the sugar, cornstarch, cocoa powder, and milk in a small saucepan over medium heat. Bring to a simmer, and stir until thick, about 2 minutes. Remove from heat; stir in vanilla and butter. Transfer to a heatproof bowl, and refrigerate until cool, approximately 20 minutes. Stir the chocolate chips into the cooled chocolate mixture. Pour into molds and freeze until firm, about 4 hours.